One week ago, on June 17, Guerrero’s ministerial police detained and brutally beat the spokesperson of the Council of Ejidos and Com munities Opposed to La Parota Dam, Marco Antonio Suástegui Muñoz. He is pointed to as the one probably responsible for “the commission of different illicit acts.” Recently, Marco Antonio organized a self-defense group in the rural Acapulco zone, with the support of the Regional Coordinator of Community Authorities-Community Police (CRAC-PC). This weekend, deputies from the PRD, Citizen Movement and Heladio Aguirre, will intervene in favor of the community police leader of Olinalá, Nestora Salgado. Comandanta Salgado is unjustly detained in the Tepic women’s federal prison and has been the victim of serious violations of his rights. One day later, the CRAC-PC faction led by Eliseo Villar Castillo attempted to violently takeover the historic seat of the San Luis Acatlán House of Justice, in which its detractors participate. At least one community police agent died. The conflict has a historia behind it. In 2013, the CRAC suffered a strong implosion. The internal cohesion cracked and different groups and leaders disputed the leadership of the movement and interlocution with the State. The currents attacked each other furiously and launched grave accusations in each other’s faces: paramilitaries, agents of the government and traitors. The essence and direction of the original project was lost. In its 19 years of life, the CRAC has suffered three ruptures. The first, with the group that vindicated itself as “founding peoples,” founded the Union of Peoples and Organizations of the State of Guerrero (Upoeg, its initials in Spanish) in 2010, was expelled from the Coordinator, and in June and September 2013 it unsuccessfully tried to takeover the San Luis Acatlán House of Justice. The second, also in 2013, was the product of the clash between the communities of Tixtla, Olinalá and Ayutla, which followed a more radical dynamic of social mobilization. And the third, resulted from a severe fracture inside the leadership team of the House of Justice. The state government’s intervention has been a key factor in the development and exacerbation of the internal contradictions of the Coordinator. The authorities seek to domesticate it anyway possible, take away its autonomist edge and impose its agenda by virtue of financial cannon shots and repression. The local and federal governments desire to disappear by any means the spaces of resistance to the mining invasion in the zone. Curiously, all the parties in the fight admit that the government foments the internal quarrel. The fracture inside this group was produced when Eliseo Villar installed an agenda very pragmatic and very tied with the state’s interests, confronting a sector of majority communities in San Luis Acatlán, advised by Valentín Hernández Chapa and Pablo Guzmán. According to Abel Barrera, Eliseo’s agenda at the front of the Coordinator is guided by the search for support to productive projects, increasing the economic resources that the state government gives them and obtaining money for the construction of the houses of justice, armament and uniforms. This orientation had as a final result that the most political theme, the theme of how to strengthen a security model of the peoples from their own cosmovision and autonomy, was blurred. Villar began to manage that resource without transparency or rendering accounts. His opponents accuse him of diverting 740,000 pesos. Additionally, he refused to struggle for the freedom of imprisoned community leaders. 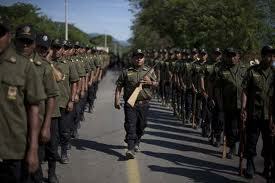 The governmental siege on the community police of Guerrero advances. The Eliseo Villar group’s attempt to take overthe historic San Luis Acatlán House of Justice is no more than the latest play to achieve it.